A sweet glaze of soy sauce, sake, and the Japanese cooking wine mirin coats these tender chunks of chicken. Thigh meat is preferable because it stands up better to high-heat grilling. As for the sake, most of the alcohol evaporates when the glaze is brought to a boil. To round out the meal, serve over a bed or jasmine rice or asian slaw. Whisk 2 tablespoons each of the soy sauce, mirin, and sake in a large bowl. Add the chicken, toss gently to coat, and refrigerate for 1 hour. In a small saucepan, combine the remaining 1/4 cup each of the soy sauce and mirin, and 2 tablespoons each of the sake and sugar. Bring the mixture to a boil, lower the heat, and let it simmer until the glaze is slightly thickened and glossy, about 15 minutes. Prepare your grill or heat a grill pan to medium-high. Lightly oil the grates or pan. 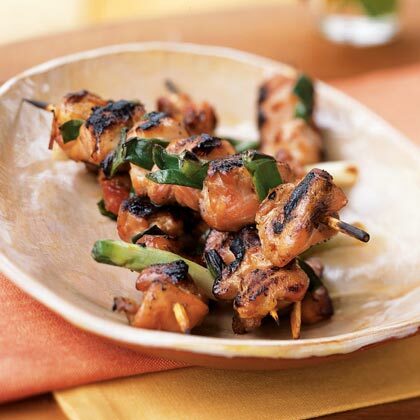 Thread 4 chunks of chicken and 3 pieces of scallion onto each skewer, alternating the meat and vegetable. Discard the marinade. Grill the skewers until seared on both sides and just cooked through, about 10 minutes, turning every 2 to 3 minutes. During the last 3 minutes of cooking, brush the skewers with the glaze on both sides, turning them often so the glaze doesn?t burn (move the skewers to a cooler part of the grill, if necessary). Brush the skewers with the glaze a second time in the final minute of cooking. When finished, the chicken and scallions should be deeply glazed. Serves 4.